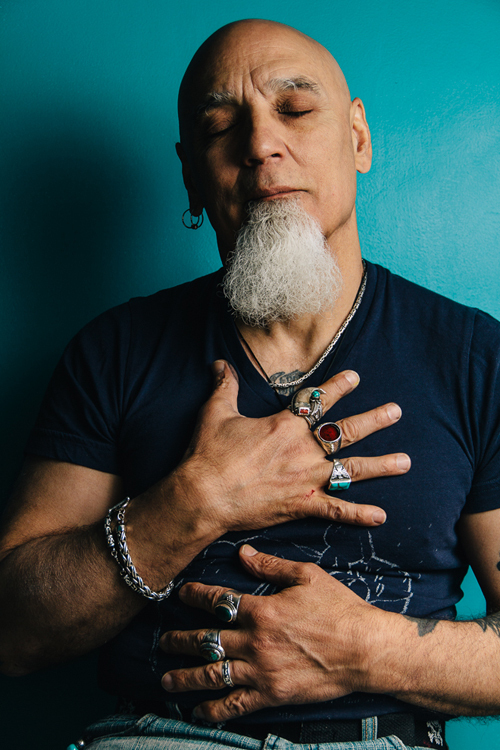 Many of you will remember Umberto (Bert) Crenca … and not just for his white goatee or his distinctive silver and turquoise rings! His speaking tour of New Zealand in 2012 ignited the imagination of people who heard him speak about the visionary arts organisation he co-founded, AS220, in Providence, USA. AS220 is an unjuried, uncensored forum for the arts and is founded on the principle that freedom of expression is crucial for the development of strong communities and individual spirits. Bert’s presentation, The Art of Community, traced the development of AS220 from humble beginnings to a major player in the revitalisation of downtown Providence and a thriving creative community. So why am I at AS220 for a month? Because I suggested Museums Aotearoa – in partnership with National Services Te Paerangi – invite Bert to New Zealand after I met him in 2010. I knew he would blow our minds … and that having blown minds was just what we needed. Then, during his visit, he suggested I come back to AS220. So here I am on an administrative residency, immersing myself as much as possible in AS220’s culture, learning how it works and being mentored by Bert. With generous support from Creative New Zealand and my workplace, I have been able to take up AS220’s offer to experience an out-of-the-box, extraordinary professional development opportunity. I hit AS220 right in the thick of it – one week before their annual street party, Foo Fest. Foo Fest is a 12-hour showcase of AS220 and its activities that attracts more than 5,000 people. There are artist installations, participatory creative activities, collaborations, over 20 musical acts, food and more. 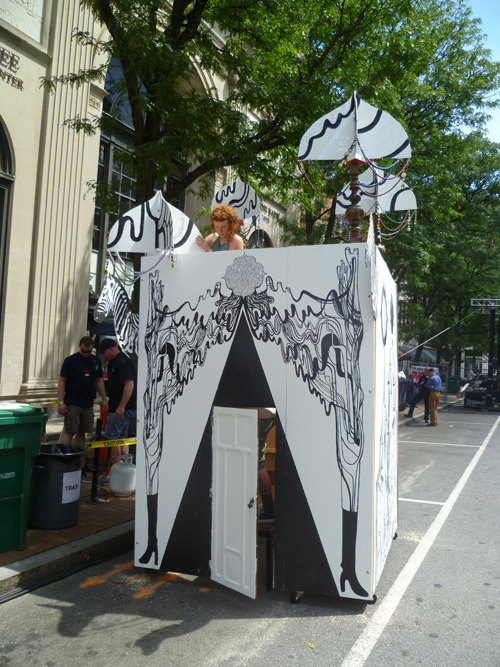 There was a lot to be done when I arrived – starting with sanding plywood birds for Foo Fest’s artist in residence Xander Marro; painting artist booths; folding screen printed bandanas; and learning how to vacuum-mould masks. 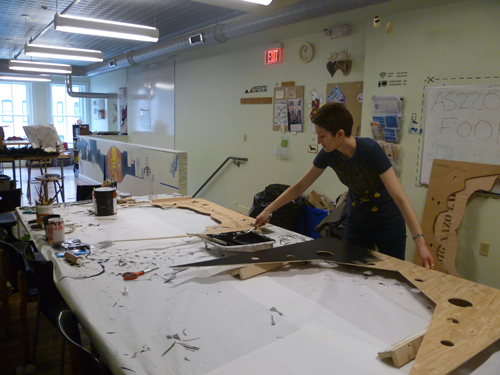 Ruth painting plywood decorations for the Foo Fest artist booths in AS220 Industries. 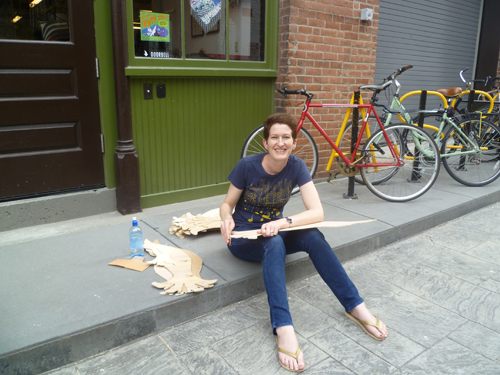 Ruth learning how to vacuum-mould masks designed by Foo Fest artist in residence Xander Marro outside AS220 Industries. Make no mistake – Foo Fest is a staggering amount of work. And it is the staff culture at AS220 that allows both the festival, and the wider AS220 community, to exist. The staff’s dedication was the first thing that struck me when I arrived. The organisation is built on a culture of trust – as Bert says, “We talk to each other, not about each other”. AS220’s unjuried, uncensored mission is at the heart of every decision that is made. Staff live the mission – and most are young artists or musicians themselves. The staff also adopt a DIY attitude to every issue or challenge. You got a problem? Figure it out. So they do. This DIY culture was on show during the prep for Foo Fest – staff designed, built, installed and manned just about every experience on offer at the festival. So how did Foo Fest go down? The majority of the set-up happened in a mere four hours. 170 volunteers were deployed across the site – one downtown city block in front of AS220’s Empire Street facility – to help it run smoothly. 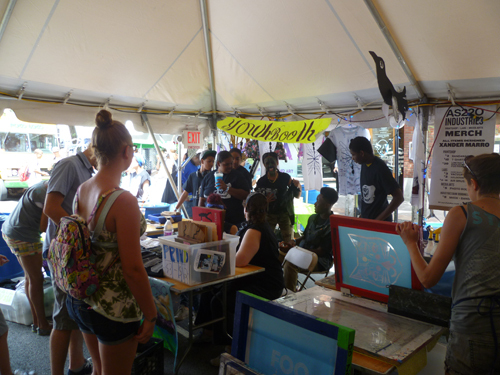 The AS220 Print Shop taught people how to screen print bandanas. AS220 Industries taught people how to vacuum-mould, just like they taught me. AS220 Labs, housed within the Rhode Island Mini Maker Faire on the day, taught people how to solder MakerBot badges with flashing LED eyes. The YouthBooth showcased art made by kids in the AS220 Youth programme. AS220 Galleries staff supported the artist in residence to design elements of the festival and various other artists to engage the public in a series of interactive booths. A flea market allowed people to come together and trade their goods. The Anarchist Book Fair also had a spot. 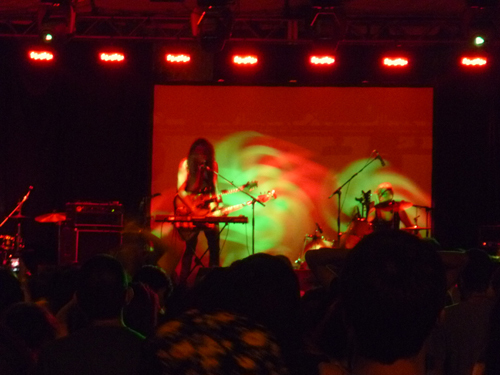 An array of Rhode Island bands performed over two separate stages. ZuKrewe, one of the Youth programme’s resident groups, took to the stage along with professional musicians. To me, Foo Fest was about people coming together to show others how to do the things they love doing. It was ‘awesome’, as any good American would say. And then the entire production was packed down within 1 ½ hours! 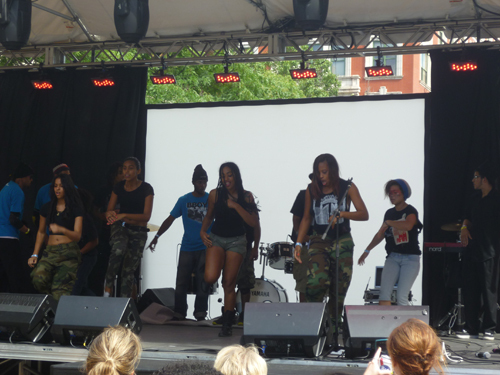 AS220 Youth’s resident group ZuKrewe performing on the main stage at Foo Fest. Providence brother-sister act Vulgarrity on the main stage at Foo Fest. A vital part of Foo Fest’s success also happens afterwards. True to AS220’s flat management structure (which includes equal pay across all staff! ), everyone is invited to have their say about Foo Fest’s success and to make suggestions for improvement. All voices are equally important. One of the biggest discussions this year involves entry charge to the festival – currently the ticket price is $7, which represents exceptional value. But should it be more? $10 perhaps? Most people would say it was a no-brainer. The fact that the conversation is ongoing shows AS220’s understanding of their community and their commitment to accessibility. Providence has very high poverty rates and any form of exclusion – even the affordability of a $3 difference in ticket price – is unacceptable to the culture of AS220. 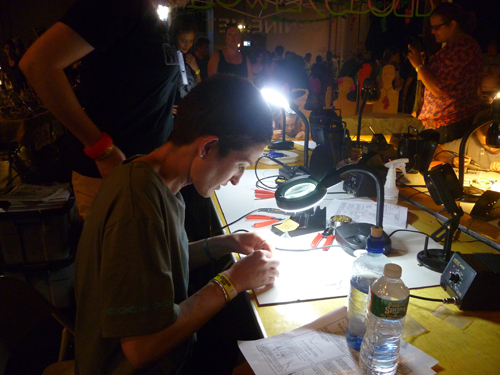 The thing I take away from Foo Fest is the celebration of creativity – of making, collaborating and teaching. It really resonated with me. Since the Government reduced funding for adult education in New Zealand, nationwide enrolments in adult community education has dropped from about 225,000 in 2009 to just 35,000 in 2012. What does this mean for our culture of DIY, of making, of creating? Shouldn’t our communities be allowed to readily learn how to screen print? How to solder? How to come together and make stuff? What kind of creative community is it possible for us to make in our own backyards? 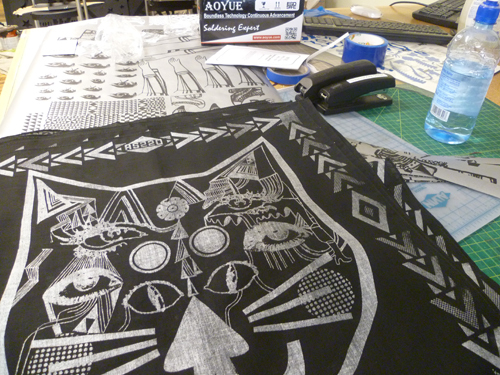 Foo Fest artist in residence Xander Marro’s cat face design printed on a bandana by AS220’s Print Shop. This blog post is one of two that follows Ruth’s time at AS220. When she is back in New Zealand, in collaboration with National Services Te Paerangi, she will be speaking at several venues nationally about her experiences at AS220 – contact Ruth on harveyr@npdc.govt.nz for more information. Wow Ruth. How exciting! Just a one day activity ( Foo Fest ) but so much to learn . How lucky you and Puki Ariki are to have this experience . I can’t wait for your next instalment. Programmes and Experiences Team at Puke Ariki are going to need a whole building of our own when you return Ruth!